Join farmworkers and Fair Food supporters from across the nation for the Coalition of Immokalee Workers’ Return to Human Rights Tour, calling on Wendy’s to make a real, verifiable commitment to protecting farmworkers’ fundamental human rights. Come out if you agree that the University of Louisville should not continue to play host to the only major fast food corporation to hold out from the CIW’s Fair Food Program. A bus of farmworkers from Immokalee and their allies will be stopping in Louisville during a 2,000-mile trek through more than a dozen U.S. cities for the monumental Return to Human Rights Tour. The CIW is ready to share its signature energy and message of hope and resilience with thousands of students, people of faith and community allies who will meet them in unstoppable action to advance the national Wendy's Boycott along every stop of the way. 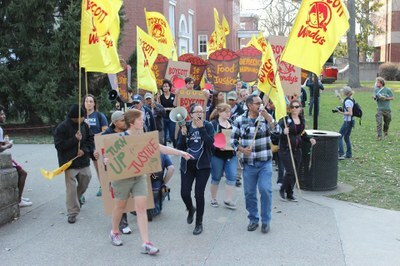 If we are to keep building a broad and inclusive movement to protect the fundamental human rights of farmworkers, and of all people at the center of struggles for justice, this kind of long-lasting vision and persistence will be needed to pull us through this uncertain moment, and to bring Wendy's into the Fair Food Program.